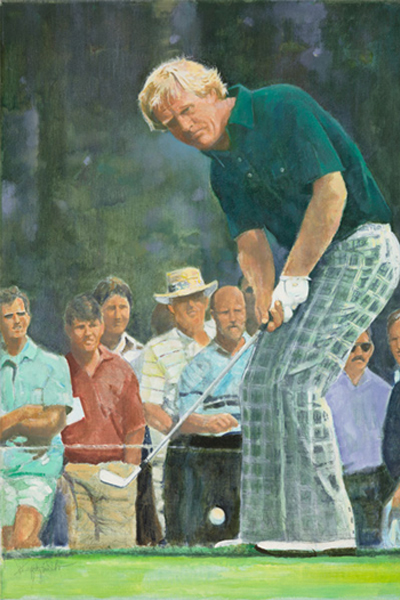 With his fifth victory in the PGA Championship, Jack Nicklaus tied Walter Hagen for the most victories and set a record for the largest margin of victory. Jack Nicklaus opened the 62nd PGA Championship with a 70 and then scrambled around Oak Hill for a 69 in the second round. On Saturday he fired a 66, the low round of the tournament, and took a three-stroke lead over Lon Hinkle into the final round. On Sunday, he turned in a 69 to beat Andy Bean by seven strokes – the largest margin of victory since the PGA Championship switched to stroke play in 1958 – and joined Gene Sarazen (1922) and Ben Hogan (1948) as the only players to win both the U.S. Open and PGA Championship in the same year.